Tying the strings to the bridge has always posed a number of problems, both in terms of function and aesthetically. Guitar makers have experimented with various solutions over the years, some of them only partial and some extremely complicated. String-Plates solve all such problems, easily and without requiring any modifications to the guitar. When a string breaks or becomes untied - as often happens with the trebles - it can very easily lash against the soundboard, creating deep grooves in the wood. 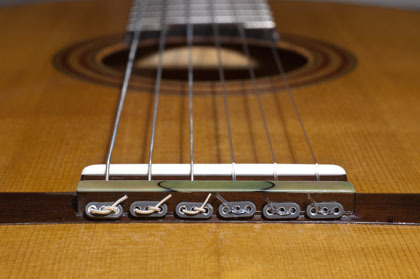 String-Plates solve this problem, in that even if the knot becomes untied or the string breaks, there is no lash effect on the soundboard. The very form of the traditional knot changes the angle of the string on the saddle. This angle is very important for the balance of forces at play on the soundboard, and directly affects the sound. With the use of String-Plates this angle is left unchanged, at what is calculated to be the correct angle when the instrument is being built. The traditional way of tying the strings, though commonly used, covers and damages the design of the cordal block. String-Plates do not damage the cordal block or interfere with its design.